Very Good. Start Here by Brett Harris, 2010-03-01. Trade paperback (US). Glued binding. 162 p. Intended for a young adult/teenage audience. Good. Start Here by Brett Harris, 2010-03-01. Trade paperback (US). Glued binding. 162 p. Intended for a young adult/teenage audience. New. Trade paperback (US). Glued binding. 162 p. Intended for a young adult/teenage audience. Fair. 1601422709 Ships from Tennessee, usually the same or next day. The BEST book for Christian teens! 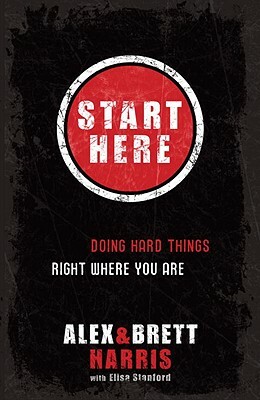 Start Here is an excellent follow-up to the Harris twins' first book, Do Hard Things. Both of these titles are definitely recommendable to any teen on the planet. Although the motto of "do hard things" is targeted towards Christians, I could see it being implemented into the daily lives of other teens as well. This book features many stories of regular teens who decided to do something hard. It really helps to illustrate that whether your task at hand is big or small, as long as you're doing a "hard" thing, you are strengthening yourself and preparing for the next bigger and "harder" thing in your life. "When your heart and mind are alert, you can see opportunities to do hard things in everyday things.... Your primary goal isn't to do something extraordinary but to do all things, even the ordinary things, extraordinarily well." An entirely new culture of a generation is burgeoning under the influence of Alex & Brett's writings. Will you join the Rebelution?